Hello foodies ! 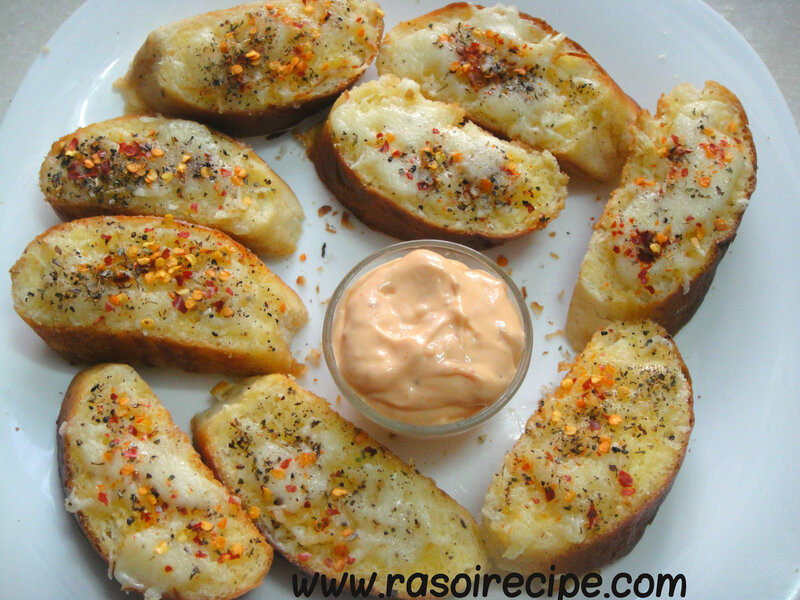 Today’s recipe is ‘Easy Cheesy Garlic Bread’. This is easy and quick recipe to make during iftar/iftari this Ramadan. It is easy dish to have as an accompaniment with pizza or pasta. You only need less than 15 minutes to prepare this dish. 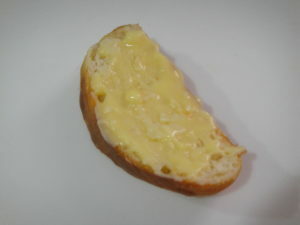 I love garlic bread with cheese as I am a big fan of garlic flavour and cheese both. You can have this as your tea time snack as well. Let’s get started with the recipe. 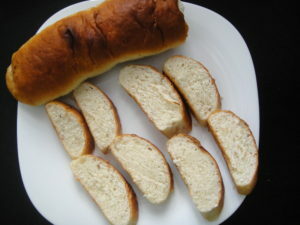 French baguette bread loaf (medium size) 1 no. Cut bread loaf in equal slices. Keep it aside. 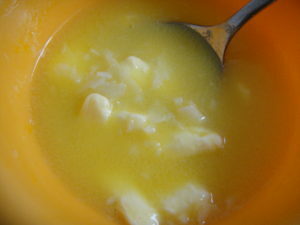 In a microwave safe bowl or a saucepan add butter and garlic. If you are using microwave cook for 1-2 mins and for saucepan cook butter and garlic with oil for 3-4 mins. In this step we just want butter to melt and have a perfect blend of butter and garlic. Melted butter and crushed garlic. Apply butter and garlic mix generously on top of each bread slice. In the meantime,pre-heat oven on 200 degrees C for 5 mins. 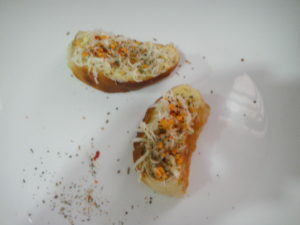 Next step is giving cheesy touch to the dish, sprinkle each slice with grated mozzarella cheese. 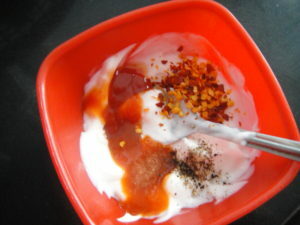 Sprinkle one pinch each of chilli flakes, black pepper and oregano on each slice. Bake the bread slices for 6 minutes at 220 degrees C. Bake it till cheese starts bubbling. Easy cheesy garlic bread is ready to serve ! Mix all the ingredients of dip together uniformly. You can enjoy this dip with other snacks of your choice. If you are using unsalted butter, do not forget to add salt in this recipe. quick and easy recipe..will definitely try it out..
you can make same recipe on tawa by covering it with lid. All you need to do is heat a tawa on a high flame, place bread on it and reduce flame to low flame and cover lid.Cook until it is toasted from all over. Do try it and let me know how it was. 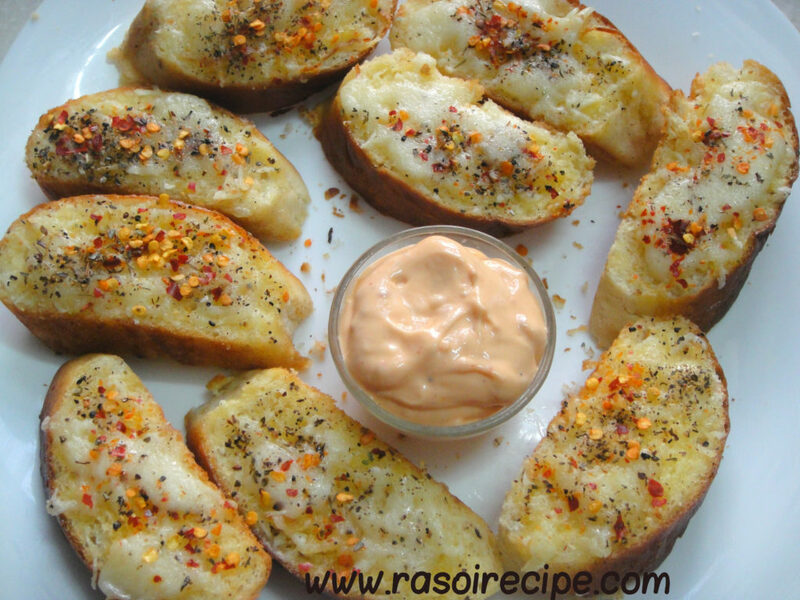 Alisha I love garlic bread.Have made it several times and my family just loves it.I wilk make the mayo dip too next time.Thanks for the recipe. 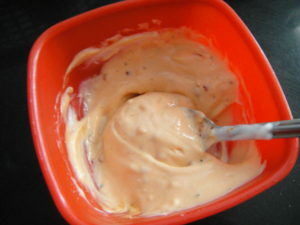 Do try this dip, it is quick and easy.